IN02 is an innovative biometric fingerprint reader for time attendance and access control applications, (optional) battery backup can eliminate power-failure problems. WL10 is Fingerprint Time & Attendance Terminal with Wi-Fi module. With Wi-Fi function, User needn’t wire Ethernet cable, it supports hotspot mode and allow mobile APPs connection and check in/out and download record directly. IClock700 is compatible with various types of USB flash disks, ADMS and former SDK. Moreover,RS232/485, TCP/IP, and USB-host/client ensures a smooth date transmission between device and PC. K40 is an innovative biometric fingerprint reader for Time & Attendance applications, offering unparalleled performance using an advanced algorithm for reliability, precision and excellent matching speed. LP400 is the latest fingerprint time and attendance terminal of ZK Software with built-in thermal printer. With SilkID fingerprint reader and innovative fingerprint verification algorithm, SilkFP-100TA is able to precisely identify wet, dry and rough fingers, and operate under strong light source. K12 is an innovation biometric fingerprint reader for Time & Attendance applications, offering unparalleled performance using an advanced algorithm for reliability, precision and excellent matching speed. 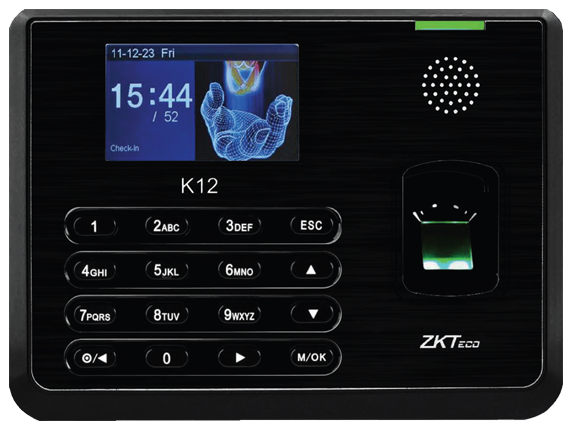 G1 is a revolutionary fingerprint time attendance device which incorporates the latest ZKTeco technology with completely new design. G2 fingerprint identification terminal features ZKTeco’s innovative Silk ID fingerprint sensor. With 3D Neuron Fingerprint Verification Sensor-Activation and Anti-Interference technology.